Expedia has Santiago de Compostela packages ready and waiting for you. Bundling your lodgings and airfares is one of the easiest ways to save money on your trip. We have more than 400 airline partners and 321,000 worldwide properties to choose from across the globe, which means your dream vacation is just a few clicks away! Not sure about your booking? You won't pay us a cancellation fee if you make changes to almost any reservation. It can be enjoyable to just roam the streets in a new place, but sometimes it's a good idea to form a plan. Grab your travel schedule — we've got some wonderful ideas for your Santiago de Compostela vacation. If you only had a single day in Santiago de Compostela, you'd want to spend it at Santiago de Compostela Cathedral. A renowned attraction that you won't soon forget, it draws travelers from across the globe. There are so many reasons to organize a trip to this alluring city, and Obradoiro Square and the Museum of the Galician People are just some of them. The best thing is they're not too far from the heart of town. Even if it's raining, it's worth going for a walk through Alameda Park. Just open your umbrella and soak up the fresh earthy smell. Travelers in this destination have heaps of options. There's nothing more enlightening than time-honored learning institutions. University of Santiago de Compostela has a rich history of nurturing the leaders of the future. Still have some time to spare? Try to envisage the terrific secrets hidden in the walls of Raxoi Palace as you gaze up at its dazzling facade. You don't have to stay in plush hotels or fly at the pointy end of the plane to have a memorable vacation. Just jump into all the extraordinary things you can do while you're there! Looking forward to doing lots of interesting things in Santiago de Compostela? Why not consider a Santiago de Compostela & Viana do Castelo Full-Day Tour or a Santiago de Compostela Tour from Porto? Have some time up your sleeve? Make your way to our Santiago de Compostela things to do page for a full list of activities. 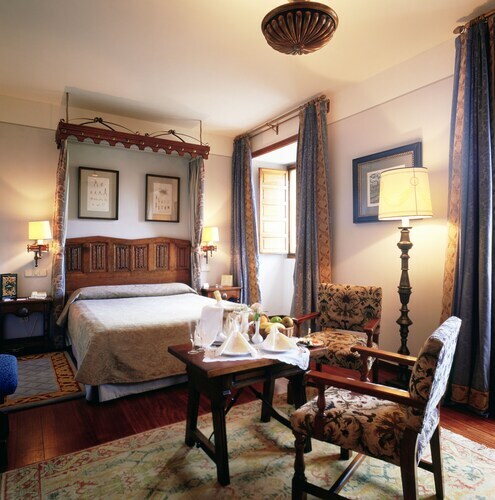 After a full day of exploring in Santiago de Compostela, have a snooze in one of 95 accommodations. The best cheap vacations and luxury getaways are only the beginning at Expedia. 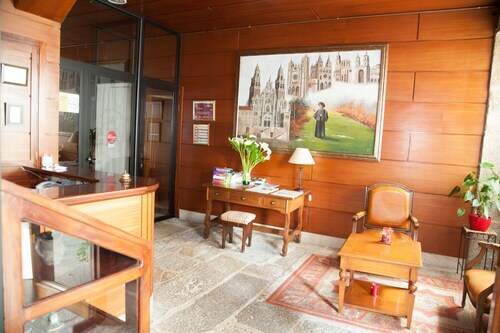 Fluffy robes, deep bathtubs and high-quality furnishings are just a few of the things you can enjoy at the Parador de Santiago - Hostal dos Reis Católicos (Plaza do Obradoiro 1) and the San Francisco Hotel Monumento (Campillo de San Francisco, 3). Book a room now for a taste of luxury! If you don't really like shelling out such big bucks, why not base yourself somewhere less expensive? Consider the Moure Hotel (Calle Loureiros, 6) or the Hotel Montenegro (Rúa de Xelmírez, 18). 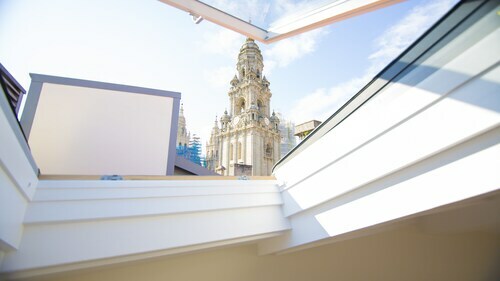 Another great option is to stay close to Santiago de Compostela Cathedral. You can do this by securing a room at the Smart Boutique Hotel Literario San Bieito, which is just 0.2 miles (0.3 km) away. Also recommended is the San Nicolas, 0.5 miles (0.8 km) away. Working out the logistics of your trip to Santiago de Compostela? Wondering where you'll be landing? Lavacolla Airport (SCQ) is your nearest option. Once you've hit the ground and wandered out of the arrival gate, you'll be 6 miles (10 km) from the bustle of the main areas. An important site of pilgrimage, this historic cathedral is considered to be one of Spain’s most extraordinary examples of Romanesque architecture. Join the locals for an afternoon stroll in this popular city park, the site of interesting monuments and frequent cultural events. Delve deep into the art, history and evolution of one of Spain’s most important pilgrimage sites and finest religious landmarks. Look inside this lovely Baroque monastery, which is home to a collection of valuable paintings, sacred objects and gold works. Discover Galician culture at this interesting museum, best known for its gorgeous 13th-century spiral staircase. Immerse yourself in the sights, sounds and smells of Santiago de Compostela at this exciting market. If you have ever wanted to know what it feels like to be a king or queen you need to stay here. Beautiful rooms with recently redone bathrooms. Architectural details and the restaurants within the hotel are top notch. 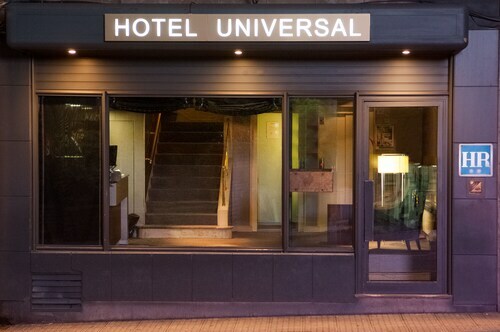 One of the most unique and memorable hotel stays. loved the location and didn't like the location! too far from historic area but close to a hospital--which we ended up needing! nice hotel close to the Cathedral/ the historic town. I would definitely stay there again. 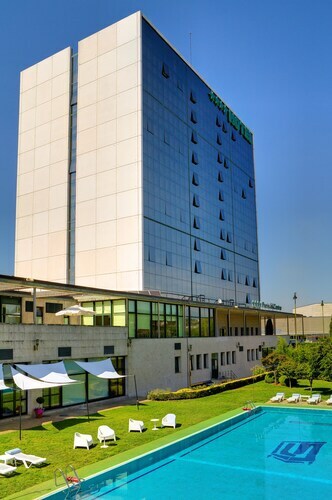 Excellent option for Santiago de Compostela, Close to the HWY, bus near to avoid driving, restaurants all around within walking distance, all around a great experience.